By University of Illinois Symphony Orchestra; Third Coast Percussion; University of Illinois Women's Glee Club; Jonathan Keeble; J.David Harris; Yvone Redman; Julie Gunn; Robert Waters; Julian Hersh; Andrea Solya; Donald Schleicher. By Augusta Read Thomas (1964-). Classical. Listening CD. Published by Nimbus Records (NX.NI6306). 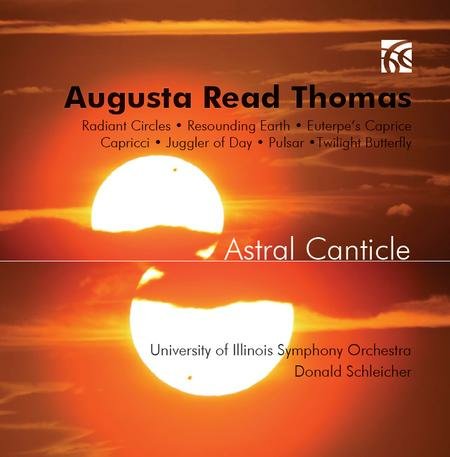 Part of a major series of recordings of works by Augusta Read Thomas being released by Nimbus Records, this recording originates from a concert by musicians of the University of Illinois, which took place on December 9th 2014 in celebration of Thomas' 50th birthday. The works of Thomas gathered here cover a relatively short span in this composer's chronology - just 13 years from the earliest work (Bells Ring Summer, from 2000) to the most recent (the song Twilight Butterfly, from 2013). Thomas the large-scale thinker is very much on display here, with two substantial orchestral works dominating the proceedings. But Thomas the deft miniaturist is also present, with a brace of vocal and instrumental jeux d'esprit written either for specific occasions or as personal messages to friends and colleagues. If there is a larger theme to be gleaned from this grouping of apparent extremes from Thomas' output, it would surely be that for this of all living composers, music acts as the ultimate means of communication, be it in the shape of a ceremonial orchestral work such as Radiant Circles, or a surprise wedding gift such as Capricci. The largest work presented here is the gently meditative and brazenly celebratory, Astral Canticle, for flute, violin and orchestra. It was premiered on June 1st 2006 by flutist Mathieu Dufour and violinist Robert Chen under Daniel Barenboim as part of his final concerts as the Chicago Symphony's Music Director. The work's two soloists are heard only very lightly supported, and their alternation with the fanfaresque sections which showcased the Chicago Symphony's legendary brass section imparts the work a "call-and-response" quality. The music's harmonic environment moves seamlessly from the open diatonicism of the chant-like solo lines at the opening through dissonances which are bracing without ever being abrasive. Such harmonic flexibility seems to embody Thomas' own words: "Old music deserves new music and new music needs old music. ".